"A THIRTEEN/Antelope South/Normal Life Pictures co-production, in association with BBC, ZDF and Arte, “The Jazz Ambassadors” tells the extraordinary story of America’s plan to win hearts around the world and counter the Cold War with the USSR in 1956 with the help of America’s most influential jazz artists. Over a period of ten years, performers including Dizzy Gillespie, Louis Armstrong, Duke Ellington, Benny Goodman and Dave Brubeck, along with their racially-integrated bands, travelled the globe to perform as cultural ambassadors and became ‘America’s coolest weapon in The Cold War’. The documentary also reveals how the U.S. State Department unwittingly gave the burgeoning Civil Rights’ movement a major voice on the world stage just when it needed one most. Directed by Peabody Award-winner Hugo Berkeley and produced by Emmy-winner Mick Csáky, the film features striking archival footage, photos and radio clips, with iconic performances throughout. American composer, Michael J McEvoy, rose to the challenge of writing an original score that would capture the atmosphere of the times, while creating an underscore that blended seamlessly with the iconic live performances in the film. With nods to jazz innovators Lee Morgan, John Coltrane and Mile Davis, McEvoy’s music is at times meditative and reflective and, at others, segues in hard-driving grooves encompassing bebop and blues. 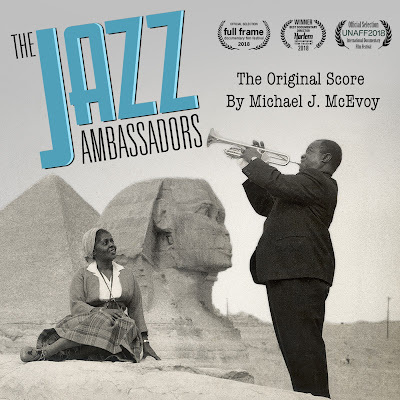 The score for “The Jazz Ambassadors” was recorded and mixed at Air-Edel Studios by engineer Nick Taylor, with the musicians performing the compositions together while watching the visuals on screen. Director, Hugo Berkeley, was present at the recording sessions explaining the story to the musicians which enabled them to deeply engage with the subject matter. In contrast to the process in many film recordings, McEvoy kept the jazz philosophy throughout by choosing a group of strong individual voices who each brought a heartfelt depth and authenticity to their performances. At the same time, the score was recorded without a click track giving the recordings a unique improvisatory feel.